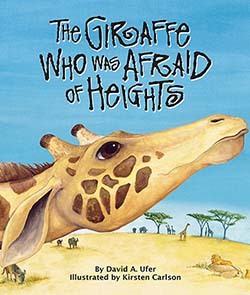 Modeled after The Wizard of Oz, this enchanting story describes a young giraffe who suffers from a fear of heights. 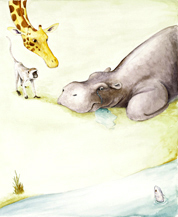 On his way to the doctor, he befriends a monkey who is afraid of climbing and a hippo who is a afraid of water. What causes the three new friends to face and overcome their fears? 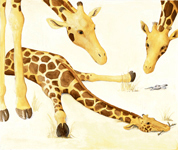 The “For Creative Minds” section includes fun facts and animal adaptation information, as well as a “Match the Feet” game and a mix-and-match activity. 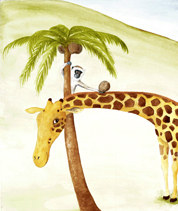 Encourages children to overcome their fears and to help friends in trouble. This fictional story includes a 5-page For Creative Minds section in the back of the book and a 25-page cross-curricular Teaching Activity Guide online. 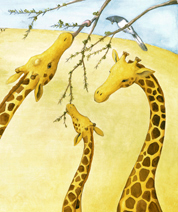 The Giraffe Who Was Afraid of Heights is vetted by experts and designed to encourage parental engagement. Its extensive back matter helps teachers with time-saving lesson ideas, provides extensions for science, math, and social studies units, and uses inquiry-based learning to help build critical thinking skills in young readers. The Spanish translation supports ELL and dual-language programs. The interactive ebook reads aloud in both English and Spanish with word highlighting and audio speed control to promote oral language skills, fluency, pronunciation, text engagement, and reading comprehension. 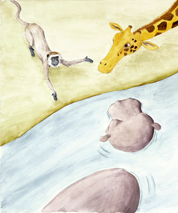 Vetters: Thanks to educators at the Houston Zoo for verifying the accuracy of the For Creative Minds section.